This week our baby is about 19 inches/48 cm long. He weighs around 6 pounds/2.7 kg. Although again I’m sure this guy weighs more than that at this point! Me and my friend Sarah who is 7 weeks behind with with her second too! Pretty much a continuation of last weeks theme of what isn’t new? I cannot believe a week has already passed. It’s been a blur of construction mess, organising, buying furniture, last minute cleaning, scheduling workmen, rehoming animals among being parents. The transition of coming to Australia and jumping straight in to house duties has been pretty unsettling for Bodhi, earlier this week we were dealing with some pretty intense power struggles, ones that I haven’t yet navigated in our parenting journey. I realised that I’m typically such a present parent with him, we have pretty structured days in LA but since we came home to Adelaide everything has been in disarray and I haven’t been able to really take the time to pay him as much attention as I usually do, so he was acting out. Also we didn’t have Isaac for a month before Australia so with Isaac comes a new dynamic there too for Bodhi, there’s an extra striving for attention. So it’s just been a challenging time for all of us. About 3 days ago it clicked in as to why he was displaying this energy shift, so I’ve been making a real effort that despite how crazy the moving is, that I take many times out a day to do Bodhi led activities and I’ve really been including him in the things I’ve had to do around the house which he is LOVING. He has been really enjoying having the folks from Wildlife SA over to help us rehome our animals because they bring this sweet little baby sugar glider possum with them! We had a beautiful last few days as a result of incorporating him more in to our responsibilities. Funny how when we as adults change our behaviour how much it reflects in our children. Lesson learnt! Seeing the house coming together! Also folding the baby’s clothes and putting them away, buying the change table, getting the Bed Nest set up, unpacking the My Brest Friend breastfeeding pillow and the infant car seat that I sent to Adelaide from LA. Lots to do still and so little time but it’s all exciting stuff. 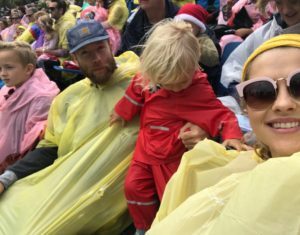 The very rainy Adelaide Christmas Pageant was really fun too, I just love immersing myself in the festive Adelaide events like a true local! Still no idea! I’ll have to get some scales this week. Nothing formal but SO much walking, squatting, putting together furniture, lifting and moving things that aren’t too heavy but still require some focus. Cleaning cleaning cleaning!! Granola, pears and yoghurt, pasta with beans, ground tempeh, olives and sundried tomatoes. PASTA! Always pasta, butternut squash gnocchi, marinated olives, stir fry etc. Mark has been cooking for us every night and it’s been amazing. Bodhi asked the baby if he wanted to wear earplugs because we have been jackhammering this week. He also wants to be very involved in packing the baby’s things in to the change table drawers. It’s very lovely to witness. Fake meats have not been my favourite this week, trying to figure out other ways to source protein. Bath with lavender and lemon drops whilst listening to The Birth Hour and Rockstar Birth Radio, it’s been my “me time” and a beautiful time to relax. I’m also craving bed even when Bodhi sleeps on top of my head, it’s my special time to read books, have some quiet time and think about the day. Now that I’m getting to the end of this pregnancy I’ve been really reflecting about how grateful I am to be able to nourish and support a healthy pregnancy. Instead of just focusing on the birth this past week, I’ve found myself daydreaming about having two little boys and what that will look like in our future. I’m so happy for Bodhi that he will have a brother close in age to him to adventure through life with, I think having a brother is a beautiful gift to have in life. I have also been reflecting on my tendency to always fill my days with something, I can’t just relax in the lead up to this birth, I’ve been really enjoying the process of getting this house together and somehow I’ve been finding comfort in the chaos of it all, I’m hoping that a week from now when I’m writing this for my 37 week that things have calmed down and I’ve allowed myself the space to start to really focus on doing less, slowing down and finding a place of mindfulness.